Interactive Chat Response(ICR) refers to an automatic response from the Virtual Contact Center to a customer's new chat request. You can configure your chat response to collect some key data that identifies the customer before channeling the chat request to the chat queue. For example, you can gather a customer's unique account number, pass this information to agents while offering the chat interaction. Based on the account number, an agent can quickly view the customer information, and then accept the request. If an agent rejects a chat request, the request enters the queue again to be offered to the next available agent. 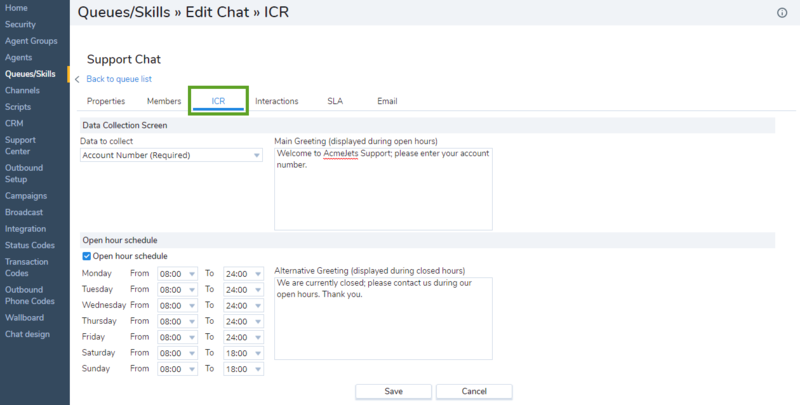 Use the Chat Queue, Interactive Chat Response (ICR) tab to specify the message the Virtual Contact Center chat queue sends in response to a new chat interaction request. The ICR tab allows you to specify a unique message for chat interactions received during open and during closed hours. Select the CRM data to collect from the customer. This step is optional. You can allow a chat request to enter the queue without collecting any customer data. Optionally enter a main greeting welcoming customers, and an appropriate question to collect desired CRM data. To specify a custom schedule, enable Open hour schedule. Specify open hour schedule for processing chat interactions. Enter an alternative greeting for closed hours. Note: Does not apply to businesses that operate 24/7. Table 31 summarizes the options available in the Chat Queue page, ICR tab. Choose the information the Virtual Contact Center prompts the user to submit before originating a new chat interaction. To enable the Main Greeting text entry area, in the Data to Collect list, choose the information the Virtual Contact Center prompts for in response to a new chat interaction. In the Main Greeting text entry area type the default greeting message sent by the Virtual Contact Center at the start of a new chat interaction. By default, Virtual Contact Center responds to a new chat interaction with the contents of the Main Greeting text entry area during both open and closed hours. To enable Virtual Contact Center to respond with an alternative greeting during closed hours of operation, select Open Hours Schedule, described later in this table. Select to enable the schedule area, then choose the hours of operation for the chat queue. If Open Hours Schedule is enabled, the Virtual Contact Center responds to new chat interactions with the greeting from the Main Greeting text entry area during open hours, and from the Alternative Greeting area during closed hours. To enable the Alternative Greeting text entry area, select Open Hours Schedule. In the Alternative Greeting text entry area type the greeting message sent by the Virtual Contact Center in response to a new chat interaction received during closed hours.